Spacious 1 Bedroom Apartment with ensuite only facilities. Bedroom is separate to lounge and dining. Fully equipped kitchen, balcony, Air-conditioned. WiFi available. Rates are for 2 people. Extra adults $25.00. Extra children $25.00. The room caters for a maximum of 3 adults, and a maximum of 1 child but cannot exceed 3 guests in total. Spacious 2 Bedroom Apartment with dining, lounge, full kitchen, ensuite, 2 balconies, airconditioning. Pool, spa, tennis, BBQ. WiFi available. Rates are for 4 people. Extra adults $25.00. Extra children $25.00. The room caters for a maximum of 5 adults, and a maximum of 3 children but cannot exceed 5 guests in total. Spacious 1 Bedroom Penthouse Apartment with ensuite, full kitchen, laundry and air con. Roof deck has heated spa, spectacular views. WiFi available. Rates are for 2 people. Extra adults $25.00. Extra children $25.00. The room caters for a maximum of 3 adults, and a maximum of 1 child but cannot exceed 3 guests in total. Spacious 1 Bedroom Apartment with ensuite only facilities. Bedroom is separate to lounge and dining. Fully equipped kitchen, balcony, Air-conditioned. WiFi available. Rates are for 2 people. Extra adults $38.00. Extra children $38.00. The room caters for a maximum of 3 adults, and a maximum of 2 children but cannot exceed 3 guests in total. 3 Bedroom Apartment with dining, lounge, full kitchen, laundry, ensuite, main bathroom, 2 balconies and aircon. Resort has pool, spa, tennis court and a BBQ area. WiFi available. Rates are for 6 people. The room caters for a maximum of 6 adults, and a maximum of 4 children but cannot exceed 6 guests in total. Spacious 2 Bedroom Penthouse Apartment with ensuite, full kitchen and laundry, balconies and air con. Roof deck has a heated spa and spectacular views. WiFi. Rates are for 4 people. Extra adults $25.00. Extra children $25.00. The room caters for a maximum of 5 adults, and a maximum of 3 children but cannot exceed 5 guests in total. Spacious 2 Bedroom Apartment with dining, lounge, full kitchen, ensuite, 2 balconies, airconditioning. Pool, spa, tennis, BBQ. WiFi available. Rates are for 4 people. Extra adults $38.00. Extra children $38.00. The room caters for a maximum of 5 adults, and a maximum of 3 children but cannot exceed 5 guests in total. Spacious 2 Bedroom Penthouse Apartment with ensuite, full kitchen and laundry, balconies and air con. Roof deck has a heated spa and spectacular views. WiFi. Rates are for 4 people. Extra adults $38.00. Extra children $38.00. The room caters for a maximum of 5 adults, and a maximum of 3 children but cannot exceed 5 guests in total. 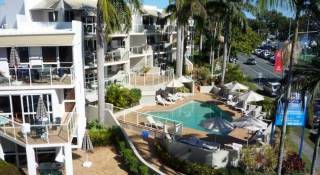 Set within beautiful tropical gardens, our Noosa Heads accommodation is ideally located just a short stroll from the pristine white sand of Noosa Main Beach and the sophisticated restaurants and boutiques of Hastings Street and the delights of Noosa Junction. 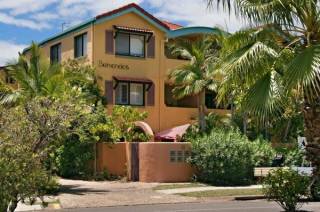 Our spacious, private apartments and penthouses come with everything you need for a relaxing break, from large, sunny balconies with spectacular views over the Noosa hinterland or our lovely garden apartments, to fully equipped modern kitchens. We have a choice of one, two and three bedroom self contained Apartments and one and two bedroom Penthouses with private rooftop spa. Perfect for a spontaneous weekend getaway or longer family holiday, we are conveniently located just a short drive from the Sunshine Coast Airport and Brisbane Airport. Our friendly staff look forward to making you welcome and enjoy a wonderful break. Relax, revive and take full advantage of our superb guest facilities during your Sunshine Coast getaway at Noosa Hill Resort. Sit back and enjoy the sun in our beautiful landscaped tropical gardens complete with a cascading waterfall. Enjoy a dip any time of day in our sparkling heated pool or soak in our soothing spa surrounded by lush tropical gardens. Enjoy a game of Doubles with the family on the resort’s full sized tennis court. For full holiday rejuvenation, treat yourself to a relaxing session in the sauna. Our games room will keep the kids entertained while you unwind by the pool. There is secure undercover parking at our Noosa Luxury Accommodation. No getaway is complete without a barbecue lunch. Tuck into an alfresco meal in our large undercover barbecue area. Take advantage of our WiFi internet access to catch up with emails and Facebook (restrictions apply). *For stays up to 3 nights, a limit of 500mb applies. For stays of 4+ nights 1.5gb limit applies which lasts for 7 days or until it runs out. Additional data blocks can be purchase, please contact reception for more details. 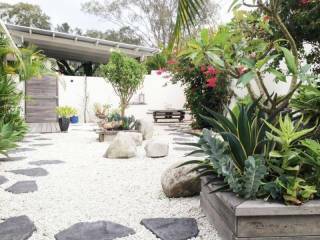 Noosa Hill Resort has membership with Frank's Gym, the longest established and well-renowned gym located in Noosa Junction. Guests can have access to the Gym during their stay, including to available sessions (such as body pump, body step, pilates etc). Conditions do apply - just ask our friendly staff and we can schedule visits for you. Noosa Hill Resort has free undercover security parking (1 only per apartment) with access after 9pm by security codes only. Office Hours 9am-5pm - Please note that if you intend to arrive outside of office hours, please contact us prior to day of arrival to make arrangements for key collection and check in procedures. You'll pay during your stay direct with the Noosa Hill Resort. 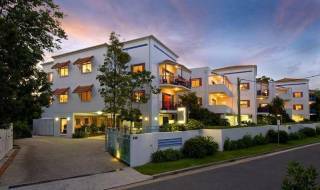 The balance is to be settled upon arrival at Noosa Hill Resort. If however you are booking a single night stay (short notice booking) within the same week of stay, the full tariff will be charged at the time of booking. Bookings cancelled more than 14 days prior to check in will attract no cancellation fees. For bookings that are cancelled 14 days or less prior to check in and where the apartment cannot be re-let for the whole period there will be a fixed amount of $150 charged. In case of no-show, the total price of the reservation will be charged. 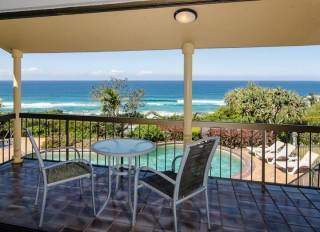 Noosa Hill Resort is a 1 1/2 hour drive North of Brisbane Airport, 25mins. from Maroochydore Airport. All bus links from Brisbane, Maroochydore and locally will drop passengers/guests at our door step. Local buses & taxis frequent Noosa Hill. A boardwalk connects Noosa Hill to Hastings Street and Main Beach. It's also a short walk to Noosa Junction in the other direction. Our Reception Office has a wide range of local tours and attractions available to guests. We can book tours and make travel arrangements for our guests free of charge. The Resort itself has an outdoor heated swimming pool and spa, sauna, games room for the kids, full size tennis court and Barbeque area with 2 BBQ's and seating for up to 12 people. Hastings Street is only 650m away and Main Beach just past there. Noosa Junction has shopping and main supermarkets and is less than 350 metres away.